My name is Heidi. But prefer to be called Snowrose as that's what everyone calls me. I am profoundly Deaf and that's by way of genital birth... During the rubella/German Measles epidemic in the early 60s. I used to think I liked beading. I had a challenging time trying to understand the instructions. They were like puzzles to me! I bought a new table weaver and am extremely interested in weaving! It has fascinated me for years upon years! In January, to be exact, 21, January 2018 I made my first starter. I made focaccia sourdough bread and that turned out well. I've learnt NOT to double the recipe!! I made my first SD bread but it was a total flop. I was told it was over fermented. I left it in the Br�d Taylor proofer overnight at 80�. I have not made breads since then due to the failures. I still have confusions with the starters. I am not able to understand why some starters I see, are very active whilst mine are both fine but not aggressive as what I've seen. 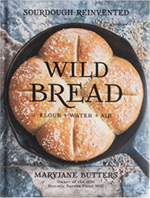 Btw, I pre ordered Wild Bread and love it! I've yet to make any of the recipes out of not having confidence in myself. I hope to have confidence restored. This whole SD baking process has me unbelievably fascinated!!! Welcome Snowrose from northeast Texas. I'm looking forward to hearing about your adventures with Wild Bread. Hello Snowrose. Wild Bread (MaryJane&Ashley), have made SD bread making an adventure for success. Glad to see another fellow bread maker ready to take on this new and rewarding experience. Welcome to the chatroom, Snowrose! I hope that you do make some of the recipes from Wild Bread. I think that the fact that there are so many different methods and opinions out there for the best approach to sourdough making make it seem more complex than it really is. Truthfully, all you need to create a bubbly, active mother is flour, water, and air. What kind of flour are you using for your mothers? Hello Snowrose! I�m in Holmes County, Ohio, so we are practically neighbors! Sourdough can seem complicated until you get the hang of it, then it is easy! Just hang in there...and this forum is going to help a lot! Browse through the posts, there are helpful pics of what the starter should look like etc. My mom is the only sourdough baker I know right around me, and she doesn�t bake much for just herself, so I�m kind of on my own too. Welcome! Hello to all of you whom have welcomed me with open arms! Firstly, I wish to apologise for not responding earlier. I've never used a chat room and am hoping this works out. I cannot figure out how to respond to individual parts. Due to personal reasons, I have not been online much. Now appointments for this week is just twice this week. Next week is everyday. In due time I cannot wait to be finished with those hours long boring appointments! Hello Nelle! I'm not overly familiar with Ohio. I'll have to Google to find out where Holmes County is located. 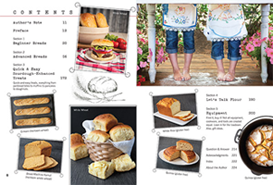 If we are close enough, we need to give ourselves a party day of making SD breads in due time! When did your mother first start making SD starters? I just started January 21, 2018. The type of flour I use is KA unbleached flour and Deer park filtered water. My starters have never been aggressive like I've seen in pictures. But!! One time I thought there was a problem with the starters, so I decided to add 60g of rye flour from our local co-op (organic of course) with 60g of water. Umm!!! Next day I saw a huge mess on top of the fridge! I haven't messed with that again! So I only use KA flour. I would include the pictures but do not know how to do that in a chat room. I have an old 80s Magic Mill that is in storage. I need to clean it and sell it as the sound bothers me. I used to mill hard red winter wheat and hated it. I'm just not a wheat person and never have been. I'm more of a strictly organic unbleached white flour type of gal. I am open to different flours that do not have the wheat (dense, heavy) taste to it. I made SD focaccia yesterday, but started it the night before. It was picture perfect except that the darned focaccia decided to cement itself to the pryrex pan. Ugh... I just hope this isn't a curse put upon me. I'm determined to succeed as there's nothing better than SD breads and whatnot! To see my focaccia, go to freespirited(underscore)snowrose and hopefully you'll see the very first Instagram pictures I've put up yesterday! I'm going to discard and then feed the starters right now so I can hopefully find something to make tomorrow using its then fresh discarded starters. I've had difficulty getting KA flour to work and I think it's because they add barley malt to their bread flour. You should try another flour, one of the flours listed in Wild Bread.